Watch this exclusive Mr. Media interview with 40 Weeks documentary filmmakers Dominique Debroux and Christopher Henze by clicking on the video player above! 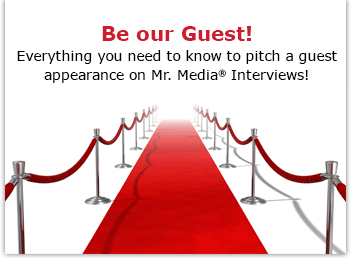 Mr. Media is recorded live before a studio audience of future moms and dads… who are just waiting for me to reveal their fate in our next segment … in the NEW new media capital of the world… St. Petersburg, Florida! 40 Weeks, a documentary film by Christopher Henze and Dominique Debroux. Download it by clicking on the movie poster above! I was up-close and personal with a pregnancy a little more than 18 years ago when my wife gave birth to our daughter. It was the best of times; it was the worst of times. Thrilling and exhilarating; enervating and exhausting; it packed every emotion I had previously ever experienced into nine months. Sometimes, into a single day. A generation later, I’ve much enjoyed watching my friends and neighbors across the street, Patrick and Jennifer, going through many of the same twists and turns that we did. That may be why watching a new unscripted documentary film, 40 Weeks, so captured my attention. Married filmmakers Dominque Debroux and Christopher Henze take us on parallel journeys with an array of women all experiencing pregnancy. Some are first-timers, some have already been around the block. At least one finds herself going through it alone, while another gets the devastating news that the cancer she successfully fought back years earlier has returned and will challenge her ability to bring a pregnancy to fruition. I know how dealing with one expectant mom could be challenging to say the least; I can’t imagine shepherding an entire platoon through 40 weeks – and the presence of a camera crew. This should be quite interesting.